The Economic Research Institute, in joint collaboration with the Bank of Mongolia has successfully organized “The Current State and Perspectives of the Mongolian Economy 2019” forum. In the forum, presentations on key topics such as foreign direct investment, mining contracting, taxation, and economic vulnerability were presented and discussed. Organized annually and in its third year, the forum is supported by international organizations such as JICA and PEP. The presentations shown at the forum are available to download below. We are pleased to invite you to the upcoming forum on "THE CURRENT STATE AND PERSPECTIVES OF THE MONGOLIAN ECONOMY-2019”. This forum is a joint collaboration between the Economic Research Institute and the Bank of Mongolia with support from Japan International Cooperation Agency. Please complete your registration with the link below before the 11th of March at 18:00. 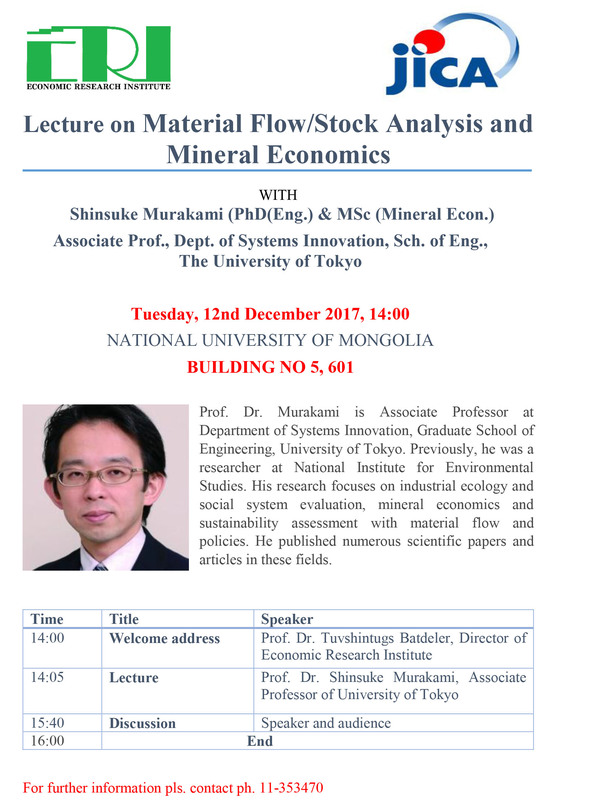 Prof. Shinsuke Murakami will give a talk titled "Material Flow/Stock Analysis and Mineral Economics" followed by Q&A session. The seminar will be held on Tuesday December 12th in Suite 601 of Building 5 of National University of Mongolia at 14.00 pm. Please click here to participate to this interesting lecture. The presentations given at the seminar are available through the link provided below. According to the June “Housing Price Index,” the results of the June survey was 14 percent. This is a 2.37 percent decrease from last month and a 4.15 percent decrease from the beginning of the year as well as an 8.4 decrease compared to the same period last year. 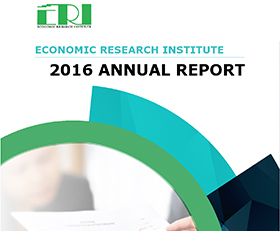 According to the June 2015 “Housing Price Index,” the results of the June survey was 14 percent. This is a 2.37 percent decrease from last month and a 4.15 percent decrease from the beginning of the year as well as an 8.4 decrease compared to the same period last year.